← Demand Justice for Sheila Oakley! 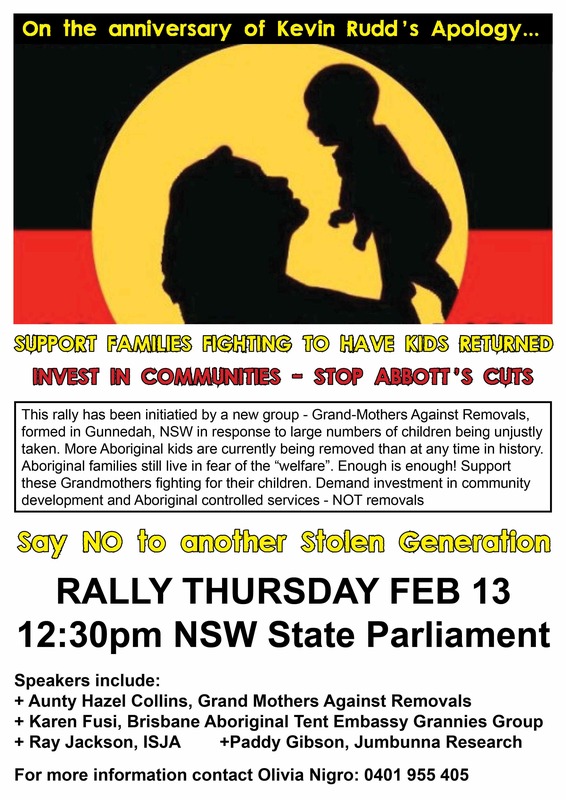 Grandmothers and families from Gunnedah will rally outside NSW Parliament House today at 12.30pm to demand an end to what they say is a new Stolen Generation of Aboriginal children. Initiated by the newly formed group in Gunnedah, Grand-Mothers Against Removals (GMAR), the rally will hear eyewitness accounts from families who have had children recently removed by the NSW Department of Community Services (DOCS). The Grandmothers say that the punitive approach of removal must be replaced with investment in support services and community development to ensure families can stay together. “Removal harms our children. The psychological, emotional and social problems they are going to have are severe. This needs to stop! We want our kids to come home!”, said Aunty Hazel, a founding member of GMAR and grandmother to over 30 children. NSW has the highest rates of Aboriginal child removal in the country with more than eight per cent of Aboriginal children in the state currently in out-of-home care. Aunty Hazel continued, “This literally affects everyone. The current removals of Aboriginal children from their families are reminiscent of the protectionist and assimilationist practices of the past. Sorry doesn’t mean much to us when our children are still being ripped out of our hands by welfare workers and police ”. Whilst Aboriginal children make up 4.2% of the population, they comprise over 30% of children in care. The Secretariat of National Aboriginal and Islander Child Care reported last year that Aboriginal children are ten times more likely than non-Aboriginal children to be removed from their families. Aunty Hazel described, “What DOCS is doing is criminal! They turn up to the house under false pretences. All of a sudden there are multiple police officers. DOCS take the child and put them in the car. If the parent and family try to prevent that from happening they are charged and arrested. There is no regard for what the parent or child is going through. DOCS come with one thing in mind and that’s removal”. February 13 will mark the six year anniversary of Kevin Rudd’s National Apology in which he pledged “the injustices of the past must never, never happen again” but since the Bringing Them Home Report in 1997 there has been a five-fold increase in the national number of Aboriginal children removed from their families. At June 2013, there were almost 14 000 Aboriginal children in out-of-home care. Aunty Hazel added, “They’re not only creating a stolen generation but they are creating a stolen heritage. They are denying Aboriginal culture and history to these children. Everything about their Being is under threat because of DOCS and it is guised as protection”. “We have a right to parent and grandparent our children and educate them on their history. This is one little town in the outback that is no longer going to be forgotten. If it takes this one town to stand up and say we have had enough, other towns will start to stand up too. We will be a voice they can’t ignore. Government’s need to be made accountable for what is happening”, Aunty Hazel concluded. Please find event details including speakers attached. This entry was posted in Aboriginal Struggle, community, democratic rights, Recent. Bookmark the permalink. On the sixth anniversary of the Australian government’s apology to the Stolen Generations, grandmothers from Gunnedah have protested against what they say is a new generation of stolen children. The group Grandmothers Against Removals was formed in January in an effort to highlight the process of removal used by the New South Wales Department of Children’s Services. The New South Wales Greens say the number of children taken since the Stolen Generations Inquiry in 1997 has tripled. “When the ‘Bringing Them Home Report’ was released in 1997 about the Stolen Generations there were a little under 3000 kids in long term care across Australia,” said Greens member, David Shoebridge. With around 6,000 Aboriginal children currently in out-of-home care in New South Wales, the Grandmothers Against Removals refuse to remain silent. They say it’s time to be the voice for other families and children who feel unable to speak against the system being accused of creating a new stolen generation. Six years ago, former prime minister Kevin Rudd apologised to the Stolen Generations for past Australian policies of forced removal. But today that apology held little meaning to the grandmothers. “Sorry they still doing it, they still taking our children so I think saying sorry is gammon,” said Gunnedah grandmother Karen Fusi. Ms Fusi travelled from interstate to share her story and to get her grandchildren back from the Queensland Department of Child Protection. “I hope that they listen to the mothers here because my daughter committed suicide because she couldn’t fight DOCS (Department of Community Services) anymore. I took my case to the federal court and I won and I just hope that Aboriginal people can keep on fighting to get their children back,” said Ms Fusi. The grandmothers and the NSW Greens are placing a direct challenge to the New South Wales Government, saying its removal policies are not working.